Comments Off on Thank you Blood Brothers! Soldier On would like to give a HUGE Thank You to the members of the Blood Brothers band. On Saturday, January 14, 2017 the Blood Brothers band held a benefit concert at Joanna’s Restaurant in Somers, CT on behalf of Soldier On. All proceeds from tickets sales and the various raffles were donated directly to Soldier On. The event raised over $17,500.00. Sponsors of the event include; Bee-Line Corporation, Attorney Bruce E. Devlin of Crear, Chadwell, Dos Santos & Devlin, P.C, Thomas Wilson Enterprises, Inc., JD Rivet & Co., Inc., Maybury Material Handling, Harry Grodsky & Co, Inc. and Forastiere-Smith Funeral Home. In addition, Rock 102 mid-day host, Dan Williams, graciously MC’d the event. Williams is a former U.S. Marine. 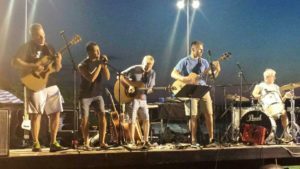 The Blood Brothers were formed in 2013 by Tim Tomko and Bruce Devlin, who are the two lead singers and also play guitar. In 2014, the two more members joined the band, Kim Cole, drummer, and Jeff Sullivan, bass and keys. The band plays a diverse library of cover music in addition to original songs. 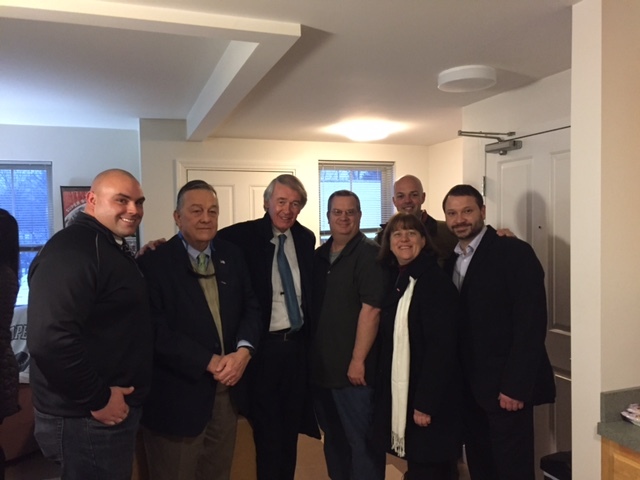 Left to Right: Sara Scoco Director of Soldier On Women’s Program , Jack Downing CEO of Soldier On, Senator Edward Markey, Bruce Buckley CFO of Soldier On, State Representative Tricia Farley Bouvier, and State Senator Adam Hinds. On Saturday, January 7th Senator Edward Markey was in Pittsfield for the Four Freedoms Coalition March and Rally. 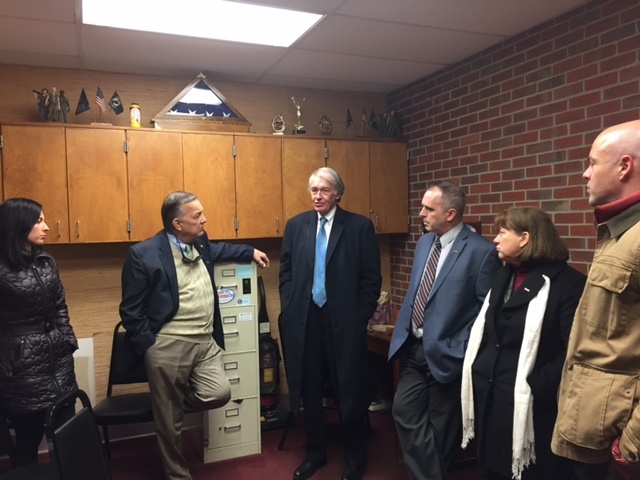 During his time in town the Senator visited Soldier On and toured the Gordon H. Mansfield Veterans Community along with Massachusetts State Senator Adam Hinds, State Representative Tricia Farley Bouvier, and Pittsfield City Councilor At-Large Pete White. Left to Right: John Crane Director of Case Management, Jack Downing CEO, Senator Edward Markey, Jeff Snyder,State Senator Adam Hinds, State Representative Tricia Farley Bouvier, and Pittsfield City Councilor At-Large Pete White. Gordon H. Mansfield Veterans Community resident, Jeff Snyder, had the opportunity to share his story with the Senator and the rest of the guests when he opened up his condo for a tour.